How to Edit YMM Searchbox Texts into my Language? How to create YMM CSV from Sample CSV? How to Import YMM Rows with Product Id? How to fix errors while Import YMM CSV into my Language? How to convert CSV file in UTF-8 format? Below you will find the detailed documentation on how to use our App and we wish you have a great experience with our Shopify App. This App is a handy tool to Search Products very quickly from large products database. 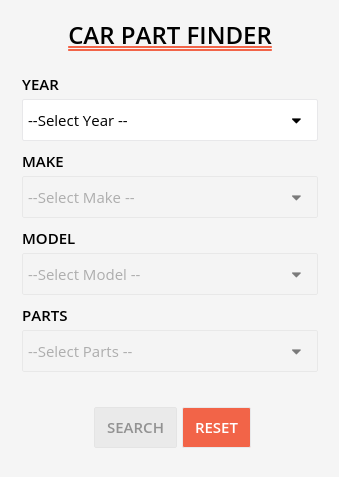 Year Make Model Advance Search allows your customers to find products on your website by Year, Make, Model or any additional fields you have created with the help of this App. 2. Click on Add app button. Step-1: Copy Template Code by click on Copy to Clipboard. Step-2: Click on Go to Theme and Paste Template Code in your Current Active Theme. From your Shopify admin, click on Online Store >> Themes and Select your Current Active Theme. 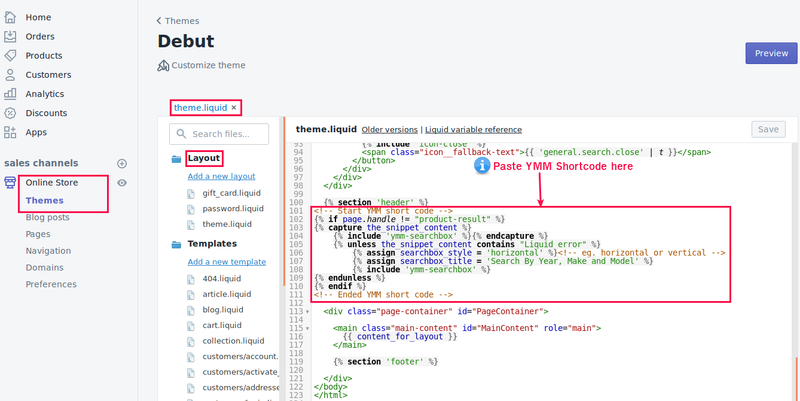 In Modify Template code section, You can Enter YMM Searchbox Title and Choose Searchbox Style. 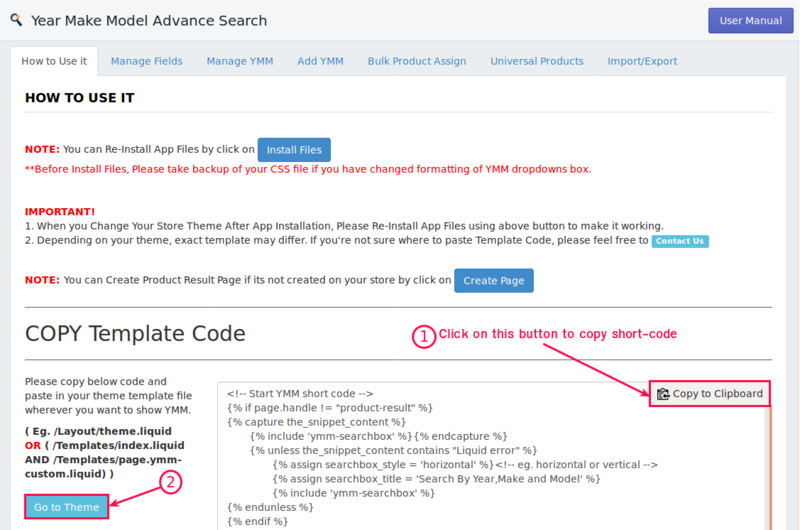 NOTE: After Modify, You need to Re-paste template code if its already exists in your theme file. Step-1: From your Shopify admin, click on Online Store >> Themes and Select your Current Active Theme. Step-2: Go to Locales Folder and choose en.default.json file. Add below code at the end of JSON File before closing curly brace ("}") but please put comma(,) first. From Here, You can ADD YMM values easily by Auto Suggestion feature, which suggest you about previous YMM values while adding a new record. From Here, You can Manage YMM data by Edit / Delete / Search operations. 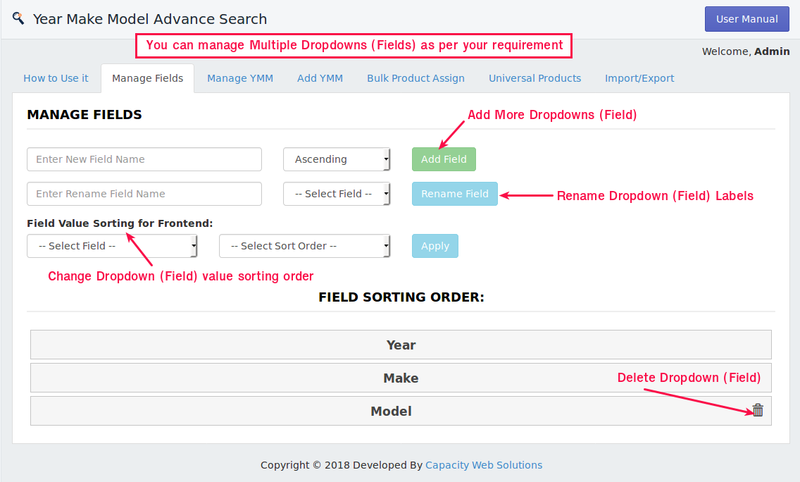 From Here, You can Bulk Assign Products quickly to Multipe YMM Rows. Question: What is the use of Universal Products ? Answer: Universal Products are very helpful to show it in every YMM Search result. How to use Universal Products Option ? Step-1: Choose option as Yes from dropdown. 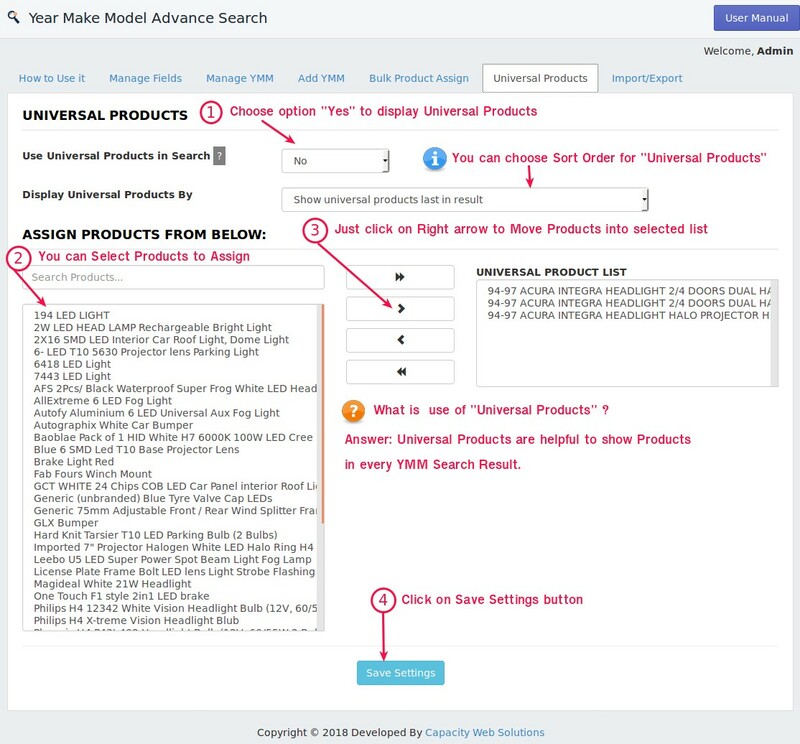 Step-2: You can choose whether to Display Universal Products First or Last from Display Universal Products By option. Step-3: Just Assign your Universal Products by Select Products from Leftside box and then Click on right arrow to move Products into selected list. Step-4: Then click on Save Settings button. From here, You can Import/Export YMM Rows. From here, You can Download Sample CSV then Modify / Add entries in it. To Import YMM Records,You have to Upload CSV File here if you're not sure about CSV Format then Please click on Download Sample CSV button. 1. Please DONOT change/delete CSV Column Ordering/Columns. 2. Whenever you Change/Add Fields. Please "Download Sample CSV" File to get latest fields and Ordering. 3. You can refer Store Product Ids by Click on Export Product CSV Button. 4. You must have to keep "Product Ids" as "First Column" in your CSV and Enter Product Ids as "~" (tilde sign) separated like snapshot. IMPORTANT! 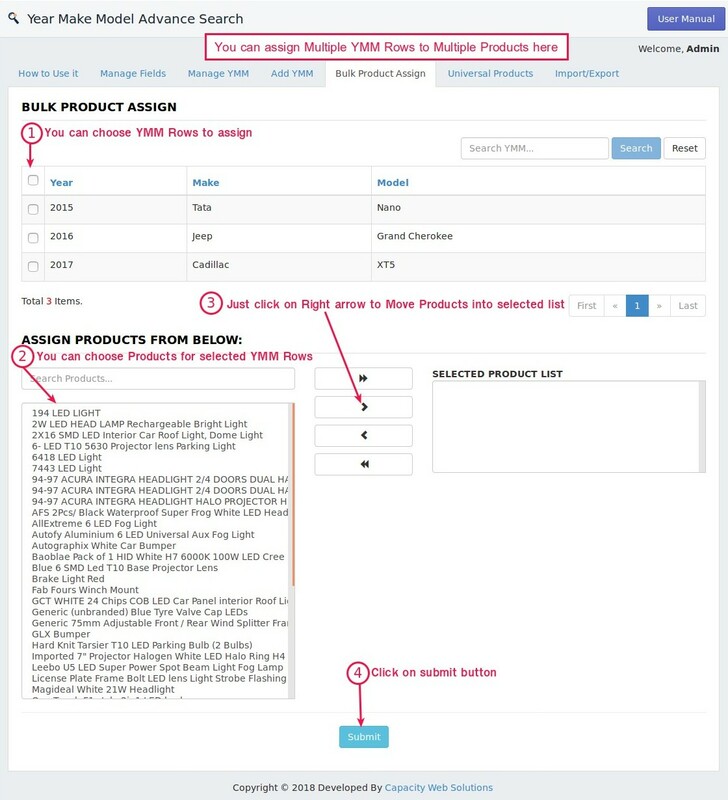 You must have to Enter "Product Id" in your YMM CSV not "Product SKU"
Step-1: Export All Product Ids CSV by Click on Export Product CSV Button. 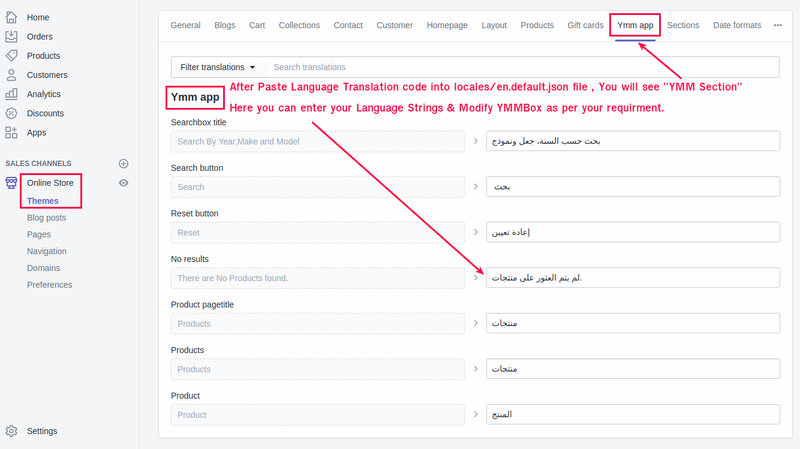 Step-3: After Prepared Final YMM CSV with assigned Product Ids then Import your YMM CSV. How to Insert Year Range Rows like - 2001-2010 ? Question: What is the use of Year Range Feature? Answer: It will allow you to import same Row for each year of range value means You do not have to add 10 YMM Rows in CSV for the year value which starts from 2001 to 2010, instead of it you just need to write one YMM row in which you have to put range value in your Year column like: 2001-2010. Step-1: Download sample CSV just by click on button to get your Fields ordering. Step-2: Then modify with your YMM range values. Step-4: Select Enable Year Ranges option and Choose your Range Field which have "Year Range Data" for e.x: If Field name is: "My Year" then choose it from Dropdown. Step-5: Then after Click on Upload button. 1. If you specify Year Range then it must be Numeric value only and it must be in four digit format YYYY otherwise it will be skipped. 2. If you have entered range value like 2002-2005 & Choose Wrong Range Field from Dropdown then it will add one YMM Row only with field value as "2002-2005" , not three rows for the years - 2002 to 2005. You can Import YMM Rows either with Bulk Insert / Append Rows / Update Rows option. How to Bulk Insert Rows? All Previous Records will be deleted by Bulk Insert option. So, please be careful & take Backup by Export YMM Records CSV first. Step-1: Download sample csv file for Adding New Rows. Step-2: Then Modify CSV for your New YMM values. 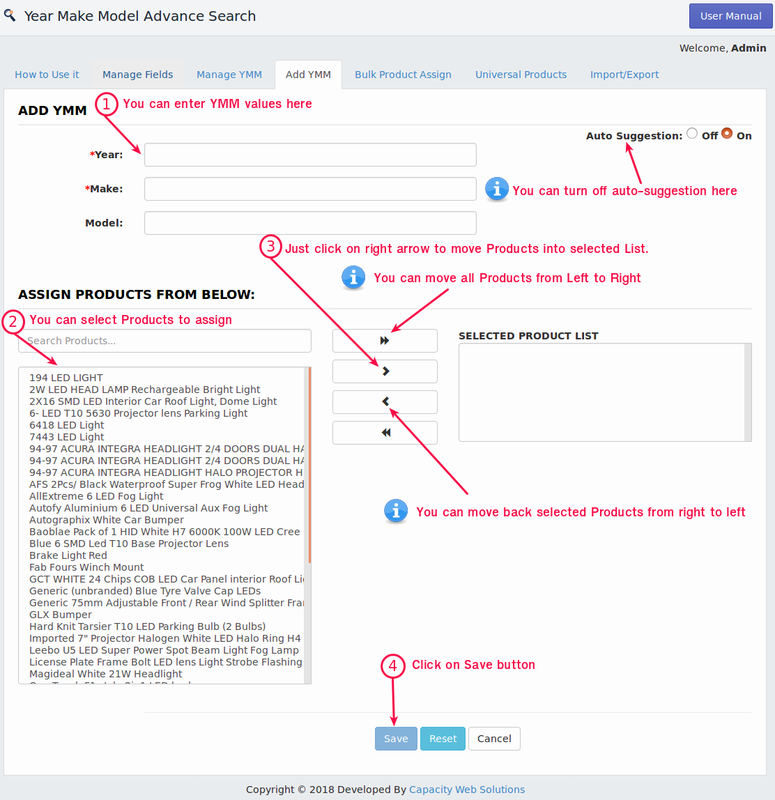 Step-3: To Assign Products to YMM Rows by CSV then just click on Export Products CSV button. - Choose your modified CSV file. - Choose Bulk Insert option. - If you have enter year ranges like: 2002-2005 then only you have to select "Enable Year range values" checkbox and choose your field that contains year range value from dropdown. - Then after Click on Upload button. How to Append (Add) Rows to existing YMM Rows? Step-1: Download current Rows CSV from Export CSV section. 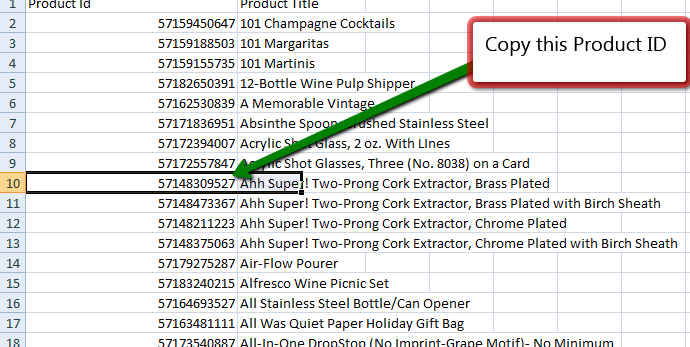 Step-2: Choose CSV Template as Bulk Insert/Append Rows from dropdown. Step-3: Click on Export YMM CSV button then open your downloaded CSV. Step-4: You can Add new Rows within this CSV. How to Update Existing YMM Rows via CSV ? Step-2: Choose CSV Template as Update Rows from dropdown. Step-3: Then Click on Export YMM CSV button. Step-4: Open your downloaded CSV. Step-5: Update YMM Rows as per your need. 1. Please do not modify "Id" column value and also keep this column as it is. 2. Update Rows will not work with year range value import. - Choose Update Rows option from Import Rows by Dropdown. You can Export YMM Rows by choose CSV Template option such as either Bulk Insert/Append Rows OR Update Rows then after Click on Export YMM CSV button. This is caused by improper CSV format.Please use openoffice.org calc spreadsheet application and saving in UTF-8 format. OR Please use Google Doc for Convert Your CSV in UTF-8 format. Please refer below section for more details on How to convert CSV file in UTF-8 format. Step-1: Go to https://www.google.co.in/sheets/about/ login using your gmail account. Click on Blank. Step-2: Go to File -> Open and upload your file. Step-4: Your file will be start downloading. Note: Don't forget to remove space from file name. How to do App Code Uninstallation manually? After App Uninstalled by Store Owner, Shopify does not permit us to access files on your store. So, You have to remove App code files manually from your Active Theme or Any Theme in which You had previously installed YMM APP Files. If you have any questions, please do not hesitate to contact us at shopify@capacitywebsolutions.com.We are happy to help! Please add our email: shopify@capacitywebsolutions.com to your address book to ensure our response email isn’t marked as spam mail. We will try our best to reply your emails as soon as possible , except weekends and National Holidays. Copyright © 2018 Capacity Web Solutions. All Rights Reserved.